I have been wanting to do a family room refresh for several months now, so when Sherwin-Williams asked if I would like to participate in National Painting Week it was the perfect incentive I needed to tackle my space! 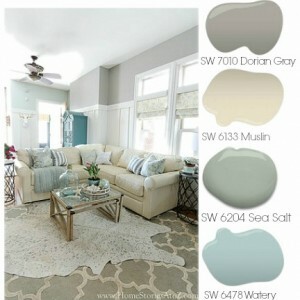 Below is a picture from my fall home tour of our family room done in Sherwin-Williams Sea Salt and Ramie. I loved this look but was ready for something new. The rug pictured below is a jute rug and unfortunately it met its demise with a bad drink spill. I replaced the ruined rug a few months ago with a gray trellis rug, and it just did not look quite right with my Ramie-colored walls. It was time to find a new shade of paint for the walls! Another problem with this space is this boring, lackluster wall. We live in an urban row home with an open concept floor-plan on the main floor. This wall makes up a large portion of the space and it needs serious help. It does nothing to enhance the space and the sea of white doors really bugs me. 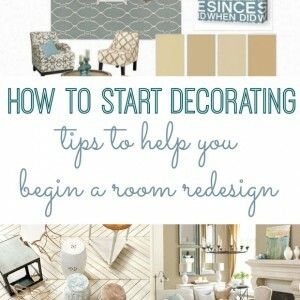 Maybe you’re currently in the same boat and are ready to give one of your rooms a little makeover. 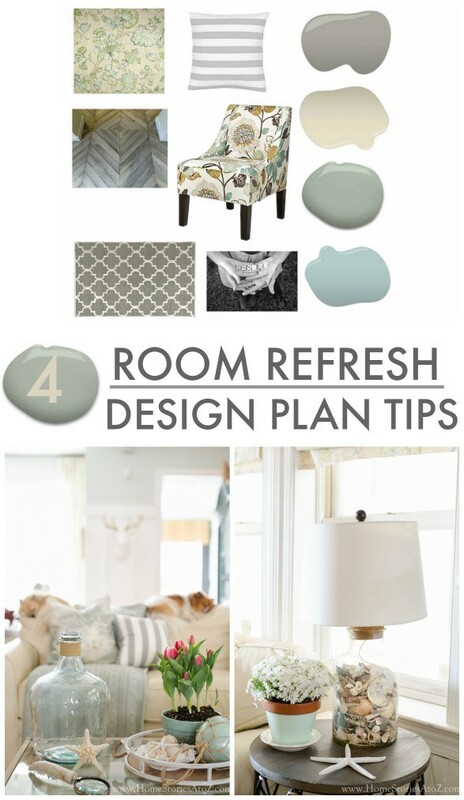 Here are some of my room refresh tips to help get you started! Room Refresh Tip 1: Remove old accessories from your room. The first thing I like to do before making over a room is to start with a clean slate. I remove all of the toss pillows, throw blankets, tabletop accessories, art, etc. that I no longer want in the space and I clean everything. This gives me a better visual for the new direction I want to go in–and it just feels freeing to have all the noise and clutter gone! 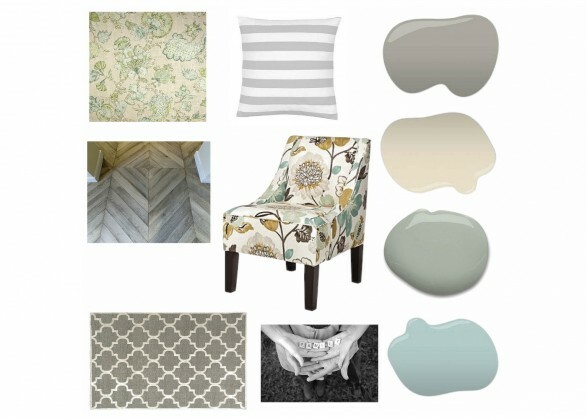 Room Refresh Tip 2: Gather online paint color inspiration. 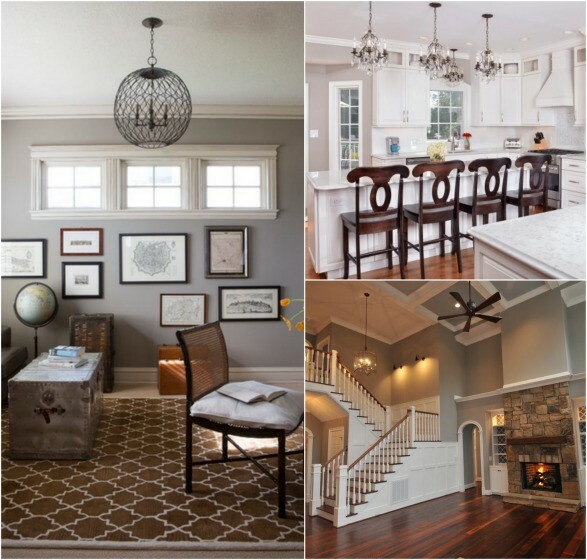 Before choosing a new paint color, I find it helpful to gather online inspiration. 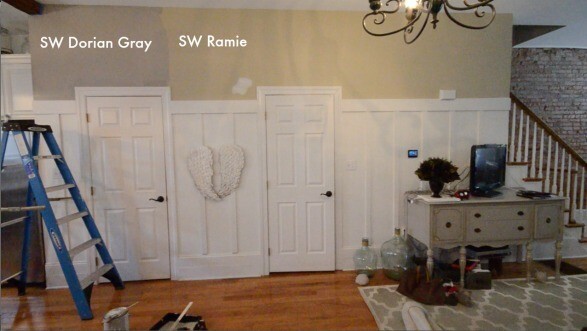 Although it is important to keep in mind that monitors and photo editing distort paint colors, an online search will help you zone in on what you like and make all of those paint swatches seem much less overwhelming! Room Refresh Tip 3: Gather paint swatches and samples. Zeroing in on the perfect paint color can be difficult. I wrote an entire post on how I go about choosing the right paint color for my space here. The most important tip I have learned (the hard way) is that it is much better in the long run to invest a few dollars into paint sample then it is to take your chances on a gallon! You might love a paint swatch but then find out that the color looks completely different once on your walls. The kind of light your room receives will sometimes significantly alter the color so it is always a good idea to test it out first. Room Refresh Tip 4: Create a design board. A design board doesn’t have to be fancy and it doesn’t have to be created online. You can use a sheet of poster board or even a notebook to create a design board. Your board should just be a place where you get a visual sense of how colors and patterns will play together. Creating a design board can help you save time and money. I hope these tips are helpful as you prepare for your own room refresh. 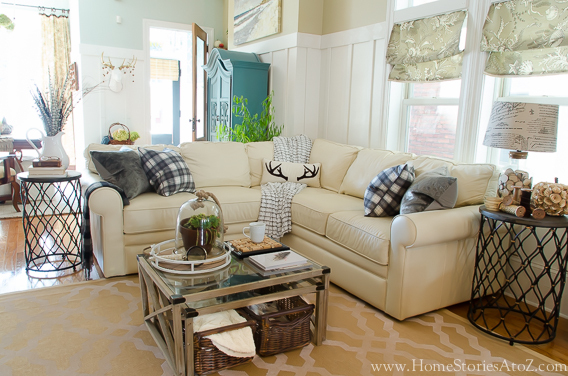 Stay tuned as I reveal my completed family room on May 11th for National Painting Week! There are many other talented bloggers participating as well so you won’t want to miss their room reveals and tips! In the meantime, here is a sneak peek of my living room. If you follow me on Instagram you can see another sneak peek of my space! I’d love to connect with you over there look me up @homestoriesatoz! Feel free to pin these tips for later! Would you like to win $100 gift card to Sherwin Williams? Follow the prompts below to enter. One winner will be chosen next week! Thanks Sherwin-Williams for sponsoring this post and inviting me to take part in National Painting Week! All opinions and words are always my own. Your room looks great! Love the paint colors! I need to refresh a room or two! We have a spare bedroom in our house that we are converting to a playroom. Painting is the first step. This is great! These colors are very close to what we’re looking to use in our new house’s living room. I’m terrible at mixing patterns, but I love your examples! I would love to refresh my living room with a pretty coat of paint. We are currently refreshing our kitchen but we can’t agree on a paint color. Great idea to use paint colors as your “palette” for a room! I desperately need to paint an entire interior.. bought an older home that is very DARK and DREARY. Peat Moss was the kitchen color.. and yes! 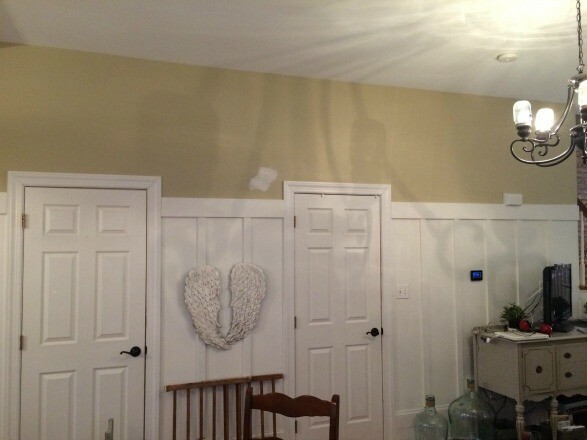 it looked like someone smeared that on the walls! GAG!! I would love to do our Family Room and our kitchen needs work badly. We’ve already done all the bedrooms and a bathroom with Sherwin Williams paint! We love it! Love SW Sea Salt. Planning on painting my living room in it in the next few months. Just moved again! 2nd time in a year! Need to paint the whole house! Love the colors sea salt and watery! I would like to refresh our bedroom for more peaceful sleeping. My dining room is in need of a refresher for sure! I’d like to refresh my bedroom! Every room in my house needs painting! We want to paint the kitchen and rearrange the kids bedroom. Oh I would love to refresh my kitchen and give it some color! I would love to refresh my laundry room! I would like to refresh my bedroom. I would love to refresh my bedroom as it has been at least 30 years since this room was painted. I would like to refresh them ALL, starting with my bedroom. Our powder room bathroom needs to be refreshed. My bedroom needs a fresh coat of paint! I would like to refresh my living room. I would love to refresh my daughters room. I would like to refresh my master bedroom. We love Sherwin Williams paint, too. We have Sea Salt and Watery in our home, too (guest bath and laundry, respectively). We also recently painted an accent wall in Drizzle, and it is my favorite wall in the house! We always buy when they are having a sale; thanks for the chance to win! Oh my goodness, would love to win!! I was just in Sherwin Williams paint Store today buying my first gallon of primer for house we just bought. Every surface in the house needs painting! Was so happy to see you picked the color watery! That was my choice too. so beautiful! I would love to use this to refresh my bedroom, we need some more color in there for sure. It is lacking. I would fix up my bathroom. I love the colors you chose. I need to finish my basement! I would LOVE to refresh my living room. It is so old and dated! Our bedroom is so boring and could use a serious color makeover! My living room. I’ll be having new floors installed this summer & I plan to paint the walls & ceilings …. so I have a good start! I’d like to put some color on my bedroom walls which are currently plain white. My entire house needs to be painted! I just love your color palate. I have a chair in my family room with the same print as the one in your design board. It is an armchair that we got from Target.com. I love it! I can’t wait to see the reveal. Great advice about selecting paint colors. I have found that many grays can read very green when on the wall so always best to get a sample jar to try the shade before committing. I love Sherwin Williams paint. Using a high quality paint really does make a difference in the finished result and I have never been disappointed with Sherwin Williams. My living room is in serious need of a new paint job. Love the grey, that’s the direction I was leaning, as my master is grey and off the LR and my kitchen in the other direction is a soft blue. Would love to paint my master bedroom, have my mind set on painting it navy blue as it is a rather bright large room. I would like to refresh my whole house, but I would like to start with my bathrooms, they seem to dark specially 2 of them since they don’t have windows. About to take on a whole house painting revolution. Thanks for this timely post. 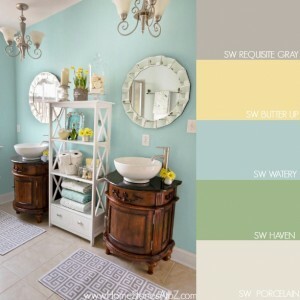 I am redoing my guest bathroom, and I am currently trying to decide on a paint color! I’m looking for a light blue/grayish tone. Wish me luck! 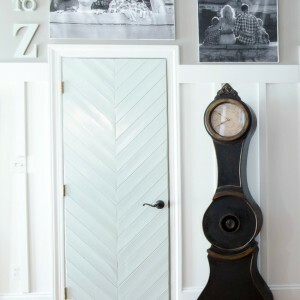 Love the idea of refreshing our home! We just bought our house in December, and every single wall is a light gray color. I love the color, but I feel like it would be nice to freshen the house up with a nice light accent color. Love your post! I’m so ready to lighten up my walls. I love the grey/beige paints. Every room! We are in the process of buying a fixer upper and have lots of tranforming ahead of us. Thanks for your inspiring work! Someday it’ll be painted a beautiful color! I would love to make our master bedroom the priority room to work on right now. We desperately need our own space to feel like home. My all time fave living room color is SW Rice Grain and I’ve got a gallon of Sea Salt waiting to go on my bathroom walls! I love the new color palette. Very calm colors. We’ve been slowly working our way through our home. Great tips! I would love to do my living room! We are pregnant with our second child and we’re turning the guest bedroom into a nursery. I would love to use this gift card to paint our baby’s special room! Sherwin Williams is great paint in wonderful colors. I love it! Great tips! I need a new look! I love the colors you have chosen. Sherwin WIlliams has always been my favorite paint. I have a guest room/office that needs repainting. It’s currently a lovely robins egg blue that my daughter picked out when she was 7 and it was her room! Love your colors! I’ve been wanting to try sea salt for awhile now. My living room needs refreshing. I love the current color, but it needs a fresh coat. This is exactly what I needed to read!! We had some patches done on our walls (nail pops and cracks) and the paint doesn’t match from a year ago :(. We need to redo our hall, a bathroom, livingroom and diningroom. I’m at a loss at where to start. I’d love to win this and get started ASAP!! I would paint a bedroom. I’m always painting something! I want to repaint my stairwell- in my pink gray blues decor, it still waits to be painted from when we moved in…it’s terra cotta orange! I die a little every time I look at it! My husband will only use Sherwin Williams paint. He says that it is the best! I think he’s right. 🙂 I’ve used so many brands of paint over the years and it’s definitely my favorite for ease to work with and reliable coverage. Looking good, Sherwin Williams is my favorite paint. Mine too! I’ve tried so many brands and good paint really does make all the difference in the world. It’s so much easier to work with than inexpensive paint.